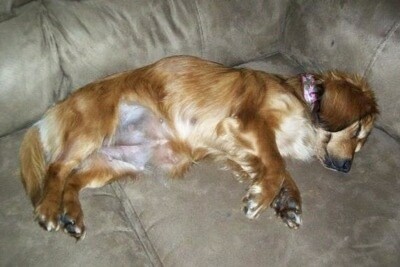 "Bella is a Docker (Dachshund / Cocker Spaniel mix) at 10 months old. She is the sweetest thing, but can be very shy around people she doesn't know if we aren't at home. She loves to jump and swim. She gets exercise every day in the backyard and needs brushed at least once a week so she can look her best!" The Docker is not a purebred dog. 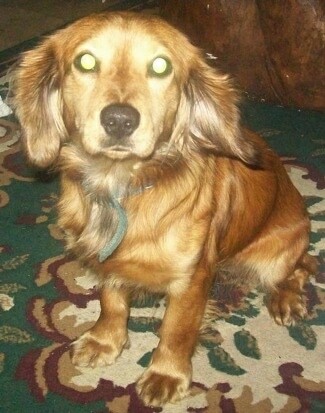 It is a cross between the Dachshund and the Cocker Spaniel. The best way to determine the temperament of a mixed breed is to look up all breeds in the cross and know you can get any combination of any of the characteristics found in either breed. Not all of these designer hybrid dogs being bred are 50% purebred to 50% purebred. It is very common for breeders to breed multi-generation crosses. "This is my dog, Ladybird. She is 2 years old, and is a Dachshund / Cocker Spaniel mix. She is a very loving and sweet dog. She's very laidback. We have 4 kids and she absolutely adores them. She loves to run and play with them, and she also loves to take car rides. 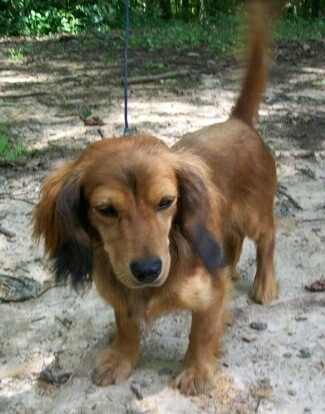 Ladybird loves other animals, but she loves to chase squirrels and rabbits! She lets us know when she has to go potty, and knows what furniture she can be on. I would not trade our Ladybird for anything in the world! She is by far the best dog we have ever owned!"